I managed to grab this book at my local MPH store. This book is so interesting that I managed to finish reading it under 3 days. 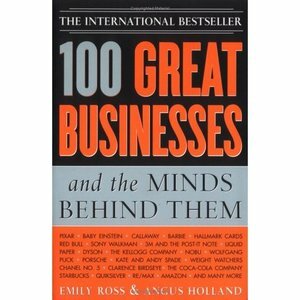 Inside the success of 100 Business Geniuses & The Minds Behind Them. Extract from Amazon below. Risk-loving entrepreneurs. Innovative geniuses. Self-starters and mavericks. The world's greatest businesses were built by unique people, each bringing their own style and savvy to the marketplace. An engrossing look at what makes entrepreneurs and business geniuses tick, this book highlights the pivotal moments in the lives of great businesses, with lasting lesson on the art of making your business a success. What i like about this book is that is a compressed historical version that shows how successful entrepreneur kick start a business or brand just from an simple idea, expand it and continue to grow it until it reached a global brand presence. It also highlights how the original founder of certain brands/ideas being booted out from their own creation and never got rich or profited from it. Sometimes, it was the non-founding members of a business idea that is able to see huge future opportunities and potentials that a business idea represents. And this group of people are the ones able to bring the idea to the next level of play hence making them very rich in the process. Moral of the story: You don't need to be a founder of a great business idea to be successful, you just need to be resourceful & hardworking enough to continue to bring that great idea to the next level. Just look at how Howard Schultz saw a huge potential in the Starbuck brand and quickly bought out the original owners of the brand and made his billions. As being historical, this book also explains the rise of a brand and also the decline of a brand in face of new coming competitors and what are the action plans to stem competition to preserve their market share. Moral of the story: It is always not too late to enter in a highly competitive market environment if you have a good product and good marketing strategy. Just look at how Facebook easily zoom past Friendster & also how Apple outgrew the PC computer sale domain under the shadow of IBM & Microsoft and into the Itune, Iphone & Ipad world segment which is raking billions for them.